I’ve been meaning to use butter beans in a recipe — I was reading about how they cook well, and they seem like an awesome, heartier substitute for grains in a meal. I was perusing Ottolenghi’s Plenty (definitely worth a look if you haven’t checked it out) and decided I wanted to make the butternut squash ratatouille — but without the zucchini and eggplant, because I don’t love how mushy they often get. (And yes, I realize those are the two ingredients that really “make” it ratatouille. Oh well.) 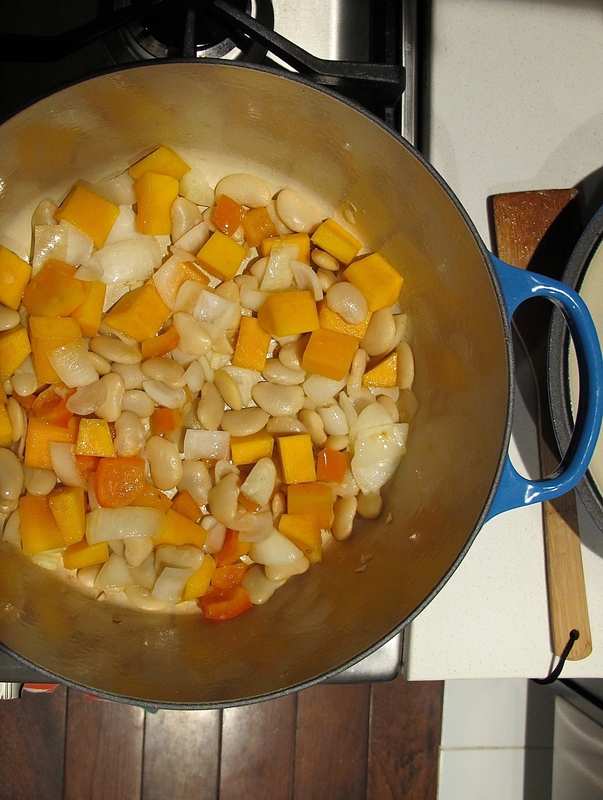 So, I thought I’d sub in white beans and make the meal more winter-y. And it was such a great choice! This riff on ratatouille is great on it’s own, over egg noodles, or over kale for lunch the next day (put the ratatouille and kale in the same container, so that the kale soaks up the flavor overnight). 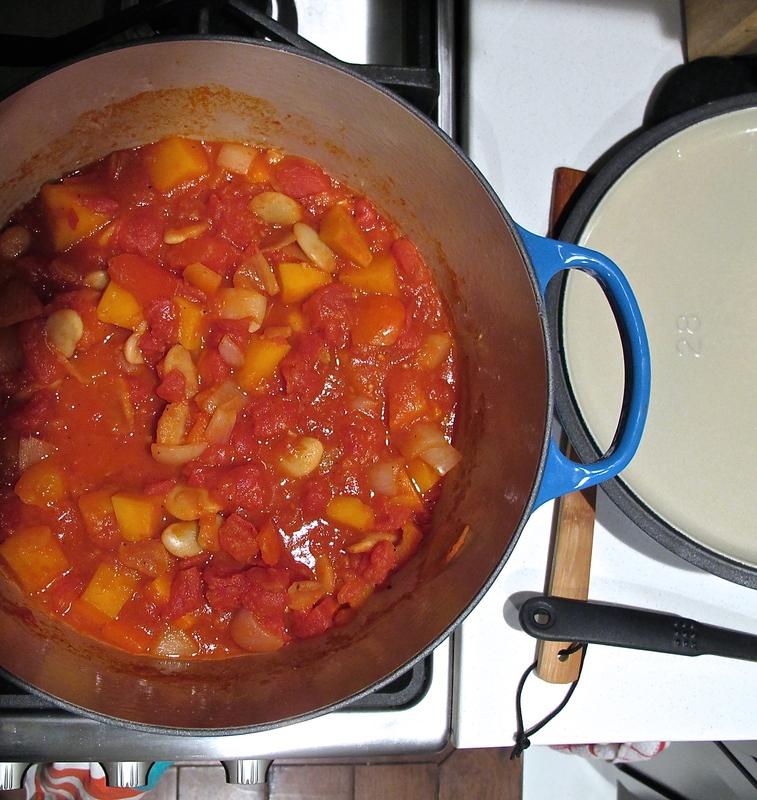 Working with a large pot or (preferably) a dutch oven, add the oil, onion, and garlic. Cook over a medium-low heat for a few minutes. 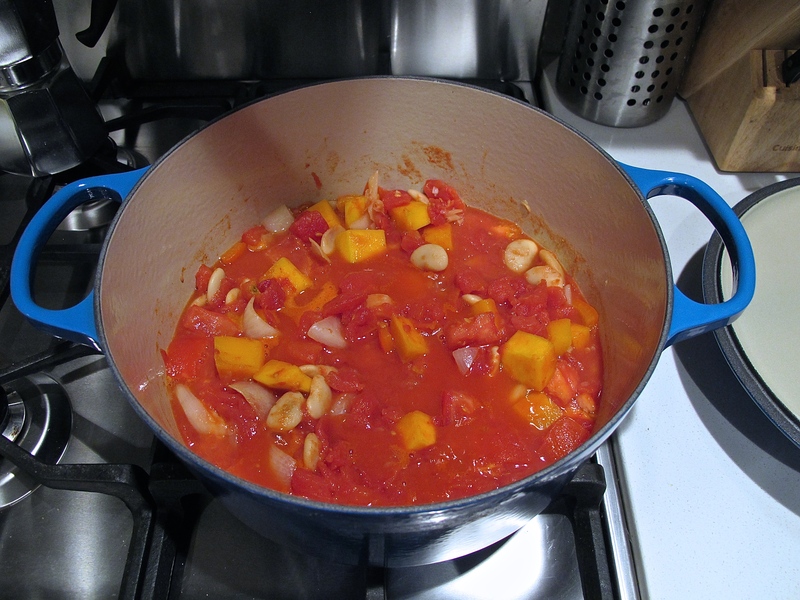 Add in the bell pepper, butternut squash, and beans and cook for another 5 minutes. Stir in the diced tomatoes, water, and tomato paste. 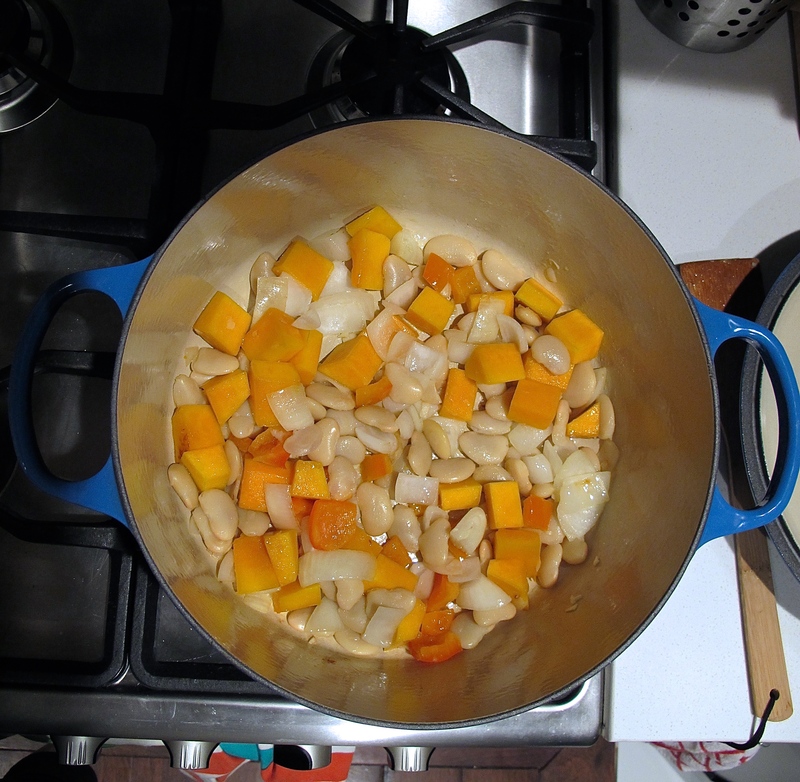 At this point, you can put the lid on the pot, turn the heat to low, and let the mixture simmer, stirring occasionally, for half an hour (or more). Serve over egg noodles, or all by itself. 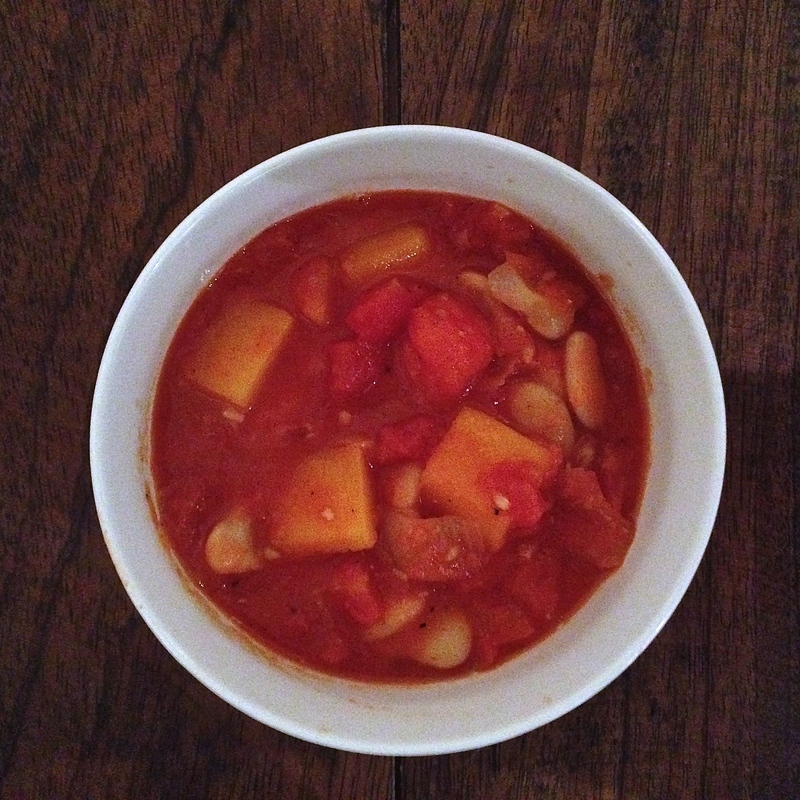 This entry was posted in Noms and tagged butter beans, butternut squash, dinner, easy dinner, ottolenghi, plenty, ratatouille, tomatoes, vegetarian. Bookmark the permalink.